My Lord, Please Sanctuary Me: Book Review: Has God Spoken? The synergistic harmony of the Bible is a powerful testimony and an enduring reminder that God has spoken--that these are his very words. ~Hank Hanegraff, Has God Spoken? It is easier to reach those without knowledge of the scriptures, but when we encounter those with such knowledge are we really prepared? I thought I was until I began reading this book! I am in a quandary as to where I even start in trying to review Has God Spoken? 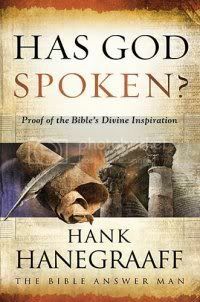 Proof of the Bible's Divine Inspiration by Hank Hanegraff, Host of Bible Answer Man! It is packed with information: external history, Noah's flood, copyist practices, archeology, the dead sea scrolls, prophecies, and so much more--definitely not a light read. Thankfully, the author used acronyms throughout the book to maintain structure and to brace against any wanderings in memory. One of my favorites was L-I-G-H-T-S: Literal Principle, Illumination Principle, Grammatical Principle, Historical Principle, Typology Principle, and Synergy Principle. This book is Christian apologetics above and beyond. It took me quite some time to finish mostly because I wanted think through each segment thoroughly before continuing. The amount of in-depth information could be overwhelming, but the writing style is accommodating and enjoyable. I think the subject that I found the most interesting was the explanation of typology prophecy and antitypes. For instance, Matthew 1:22-23 (NASB) reads "Now all this took place to fulfill what was spoken by the Lord through the prophet: 'BEHOLD, THE VIRGIN SHALL BE WITH CHILD AND SHALL BEAR A SON, AND THEY SHALL CALL HIS NAME IMMANUEL,' which translated means, 'GOD WITH US. '” This was in reference to Isaiah 7:14 (NASB) translated "Therefore the Lord Himself will give you a sign: Behold, a virgin will be with child and bear a son, and she will call His name Immanuel." However, the word almah translated "virgin" here would be more accurately "maiden." The word betulah, which would refer to virginity, was not used. Not only that but Isaiah 7:14 was actually fulfilled in Isaiah 8 with the birth of Isaiah's son Maher-Shala-Hash-Baz, so was it wrongly quoted in Matthew? No. This was one example of the typological correspondences described, in this case, between the birth of one child and the birth of the Messiah. I felt I could identify with how someone of differing beliefs yet knowledgeable in the Bible would see certain areas in scripture as misinterpretations and misconceptions on the part of Christians and how that those same areas could be used to prove Jesus was the fulfillment of those prophecies because of typology. This book is worth the read if you really want to understand scriptures from a view outside what is taught in Christian churches and how to convincingly change people's perspective of Christianity through the use of the scriptures, particularly those who are in agreement with the writings of Professor Bart Ehrman, who "deemed the historical Jesus as a false apocalyptic prophet." Finally, we should carefully note the elegant tapestry that serves as an internal evidence for the divine authorship of the biblical text. The tapestry of Scripture is a divine composite of surpassing brilliance and beauty. It is simply incredible that this exquisite masterpiece is fashioned from sixty-six books, written by forty different human authors in three different languages (Hebrew, Aramaic, and Greek), over a period of fifteen hundred years, on thousands of different subjects, and yet is unified and consistent throughout. How is that possible? The individual writers had no idea that their message would eventually be assembled into one Book, yet each work fits perfectly into place with a unique purpose as a synergistic component of an elegant masterpiece.